For over forty years, communities in Alberta, led by community based sexual assault centres, have pioneered the development of sexual violence services. Joined in partnership with the Government of Alberta in 2004, the Association of Alberta Sexual Assault Services (AASAS) continues to strive to ensure that all Albertans affected by sexual violence have access to healing and recovery programs, services and support. 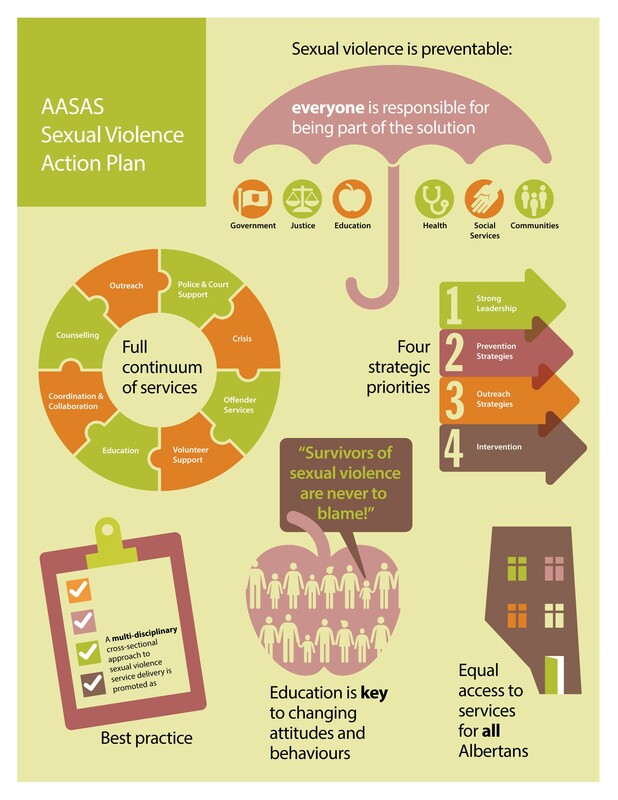 The following AASAS Sexual Violence Action Plan is the result of over forty years of front line experience, research and best practices addressing sexual violence in Alberta. The plan was developed by the AASAS network but it belongs to all Albertans. We are all responsible for creating an Alberta free of sexual violence. Sexual violence is a complex issue with no easy solutions. Important changes, such as those outlined in this plan will take time, commitment and resources from all stakeholders. But we are confident in the commitment of Albertans and that together we can end sexual violence in our communities.